Godzilla: Save the Earth is a fighting video game released in 2004 for PlayStation 2 and Xbox. 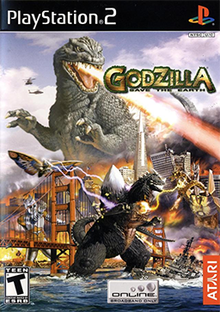 Based on characters and situations from the Godzilla film series, the game itself is a sequel to Godzilla: Destroy All Monsters Melee. Godzilla: Save the Earth was followed by Godzilla: Unleashed in 2007. The gameplay is identical to the previous game, although it plays at a much slower pace and allows monsters to use their beam attacks more frequently. New additions included elevated terrains, a challenge mode, online play for the Xbox console, and a slightly more cohesive story mode. The game introduced seven new playable monsters: Battra, Baragon, Jet Jaguar, Megaguirus, Moguera, Mothra, and SpaceGodzilla. Biollante was going to be included (as she was fully programmed into the game), but was cut due to licensing reasons. Save the Earth takes place two years after Godzilla: Destroy All Monsters Melee. The story involves mankind getting hold of Godzilla's DNA, known in the game as "G-Cells." The Vortaak learn of this, once again returning to Earth, controlling a vast army of monsters, including their ultimate weapon: SpaceGodzilla. The player faces down many controlled monsters in different locations. In the climax cut-scene, Godzilla confronts SpaceGodzilla in a final duel. Godzilla blasts off SpaceGodzilla's shoulder crystals causing a black hole to form. SpaceGodzilla is sucked in and apparently killed, forcing the Vortaak to retreat while Godzilla lets out a victory roar, having saved the Earth yet again. Godzilla: Save the Earth received "mixed" reviews on both platforms according to video game review aggregator Metacritic. 1UP gave the game a "B−" score, saying: "Godzilla: Save the Earth is a fun game and a worthy sequel to Godzilla: Destroy All Monsters Melee. If it had been afforded a little more finesse (especially regarding the Challenges) and a little more authentic Godzilla flavor, it'd be even sweeter. The fact is, though, that unless you're a Godzilla fan, there are better games of this general type out there (War of the Monsters and Def Jam: Fight for New York come to mind). Still, the kaiju in Godzilla's universe are way cooler than grown, sweaty men in tights." ^ a b c Butler, Tim (December 2, 2004). "Godzilla: Save the Earth". 1UP.com. Archived from the original on July 18, 2012. Retrieved June 29, 2014. ^ a b EGM staff (December 25, 2004). "Godzilla: Save the Earth". Electronic Gaming Monthly (186): 106. ^ a b Zoss, Jeremy (December 2004). "Godzilla: Save the Earth". Game Informer (140): 165. ^ a b Kasavin, Greg (November 5, 2004). "Godzilla: Save the Earth Review". GameSpot. Retrieved June 29, 2014. ^ Baker, Chris (November 11, 2004). "GameSpy: Godzilla: Save the Earth (PS2)". GameSpy. Retrieved June 29, 2014. ^ Baker, Chris (December 7, 2004). "GameSpy: Godzilla: Save the Earth (Xbox)". GameSpy. Retrieved June 29, 2014. ^ Lewis, Ed (November 2, 2004). "Godzilla: Save the Earth (PS2)". IGN. Retrieved June 29, 2014. ^ Lewis, Ed (November 15, 2004). "Godzilla: Save the Earth (Xbox)". IGN. Retrieved June 29, 2014. ^ "Godzilla: Save the Earth". Official U.S. PlayStation Magazine. January 2005. Archived from the original on June 3, 2016. Retrieved March 29, 2016. ^ "Godzilla: Save the Earth". Official Xbox Magazine: 68. December 2004. ^ Fisher, Matthew (November 23, 2004). "Godzilla: Save the Earth Review (Xbox)". TeamXbox. Archived from the original on March 11, 2012. Retrieved June 30, 2014. ^ a b Speer, Justin (November 30, 2004). "Godzilla: Save the Earth Review". X-Play. Archived from the original on December 10, 2004. Retrieved June 30, 2014. ^ Huschka, Ryan (January 9, 2005). "'Godzilla: Save the Earth' (Xbox)". Detroit Free Press. Archived from the original on January 19, 2005. Retrieved June 30, 2014. ^ a b "Godzilla: Save the Earth for PlayStation 2 Reviews". Metacritic. Retrieved June 29, 2014. ^ a b "Godzilla: Save the Earth for Xbox Reviews". Metacritic. Retrieved June 29, 2014.